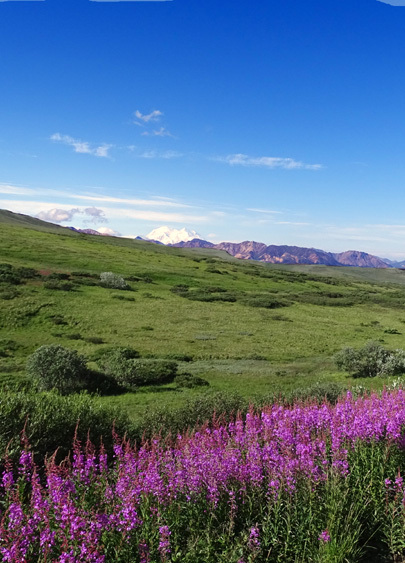 together, mountains of the Alaska Range may still be rising." 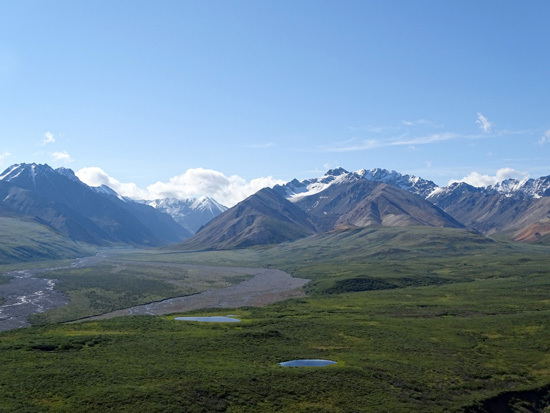 Though the visible glaciers appear remote -- gleaming between distant peaks -- the valley below is strewn with signs of massive glaciation: stranded boulders, gouged-out ponds, and gravel outwash plains. 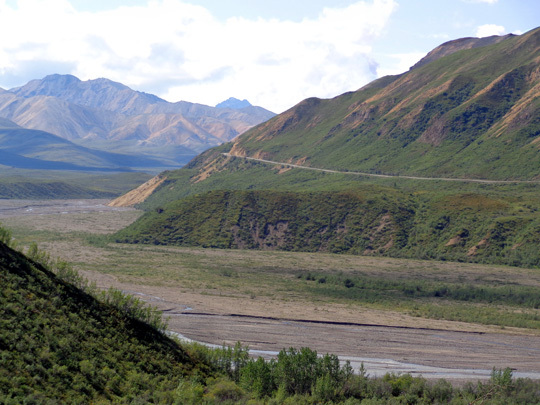 The last big glacial advance plowed through this valley about 10,000 years ago. 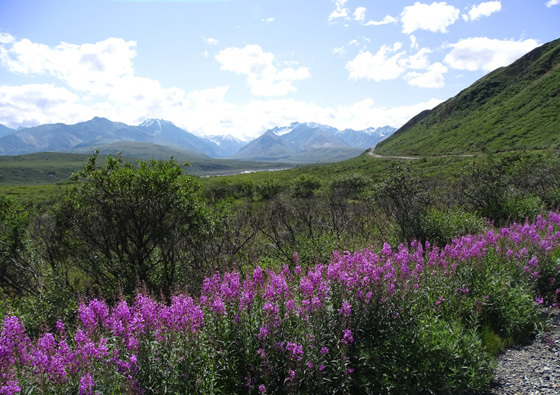 To a geologist's eye, the landscape is still active with glaciers. 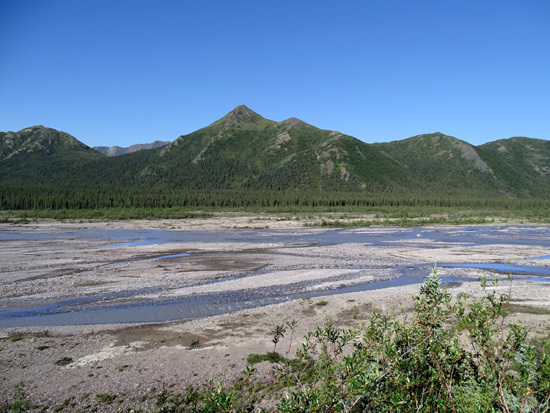 Denali's wandering meltwater rivers, cloudy with glacial silt and rock fragments, are evidence of ongoing glaciation and mountain carving. 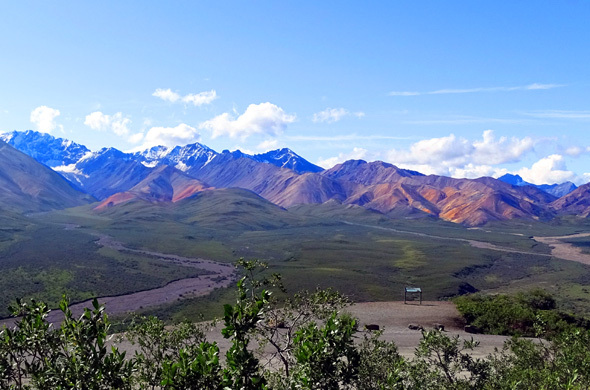 The Polychrome area is memorable in so many ways -- not only for the beautiful glaciated mountains in the distance and the colorful rocks you can almost touch from the bus, but also for the narrow road that winds about 700 feet above the valley. That's frightening to some folks. If you are afraid of heights or being out of control because someone else is driving, do not sit on the right side of the bus on the return trip to the park entrance! 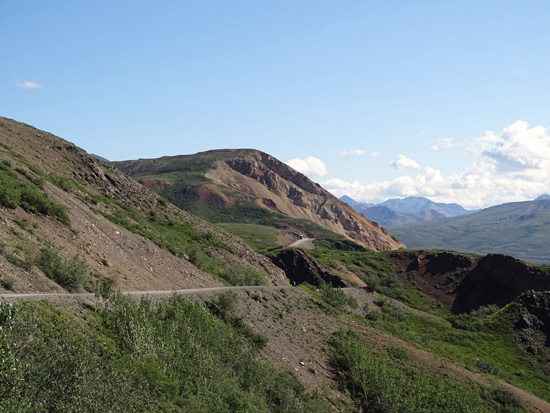 It looks like the bus is right on the edge and could go careening down the slope at any second on the curves. It's most nerve-wracking when an inbound bus on the slope side meets an oncoming outbound bus on the inside of the skinny road. If you're in a window seat it almost feels like you're hanging in space. If you want the best photos, however, DO sit on that side of the bus. Just aim out your window and shoot. I trust these experienced drivers so riding on the edge is more fun than scary to me. 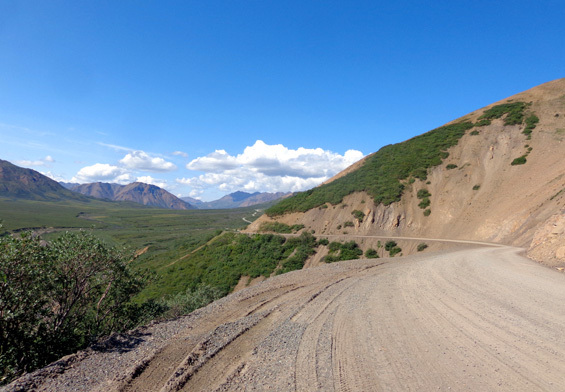 Jim and I have been intrigued with the idea of seeing this section of road up close and personal on our feet and bicycle so we took that opportunity today. Not many people do what we did but it's allowed -- and less scary than riding on the bus. 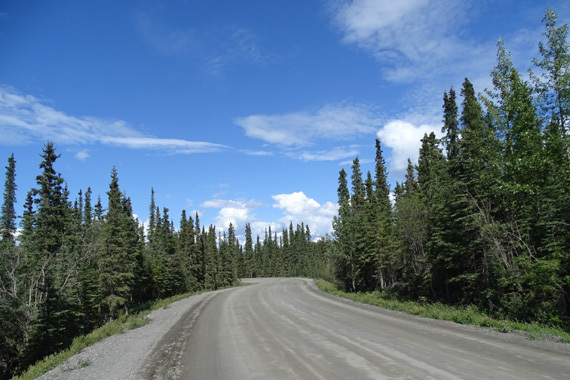 We woke up to beautiful blue sky this morning at the Teklanika River Campground. 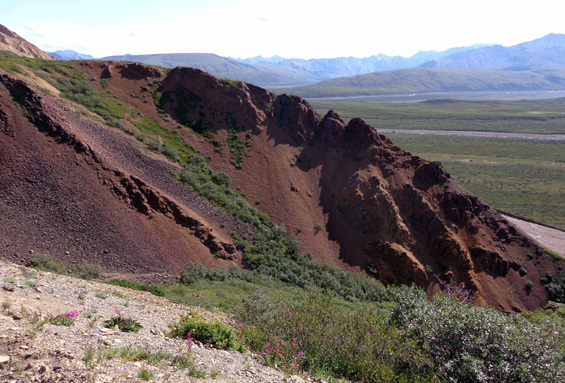 Although we had a 50% chance of showers today there were none between Tek and Polychrome Pass when we were out there. Jim left before I did. 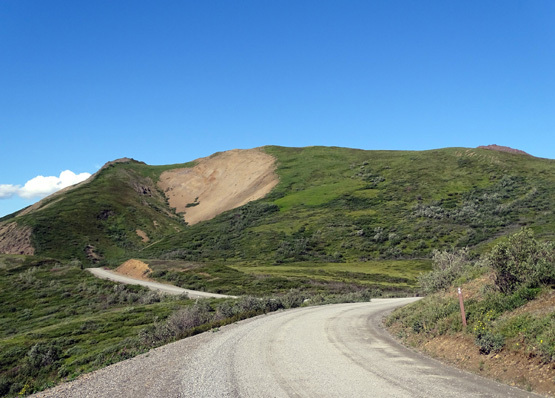 He rode his bike a couple miles beyond the pass and back, for a total of 36 miles. About a third of the photos in this entry are ones he took while riding. 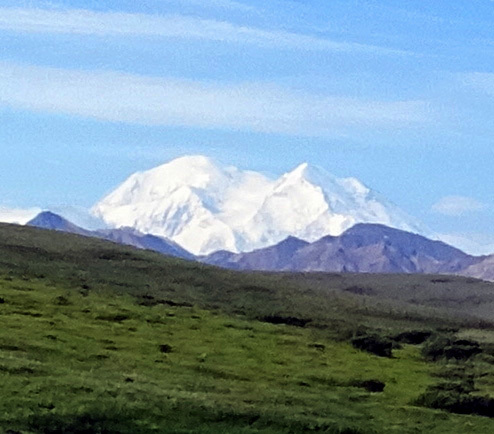 I took a bus to the pass and walked several miles there and closer to Tek. This was my third ride on my Tek Pass, which I've described in a couple previous entries. We've also got our separate GPS tracks but I don't usually include those on the website. I caught the later of two Kantishna buses at our campground about 9:45 AM. I got to sit in the second seat again, this time with a nice woman from NY. Tim stopped there on Monday so we could take pictures but wouldn't let us off the bus. 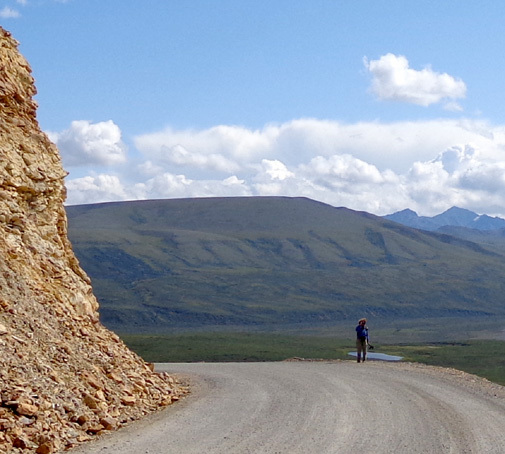 As we were going up to Sable Pass I could see Jim ahead on his bike. He pulled off to the side each time a bus came by. I told the bus driver that was my husband, and jokingly asked her please don't run over him. Then I asked her if she could stop and say "Hi, Jim!" to surprise him. I figured that way he'd know I was on the bus. Jim on his bike later in the day. Sheryl said she'd do even better than that and she did. She stopped next to him, opened the door, and yelled out, "Nice legs, Jim!" He heard his name and knew I was on the bus, but he didn't hear the "nice legs" part. I told him when I saw him next and he chuckled. 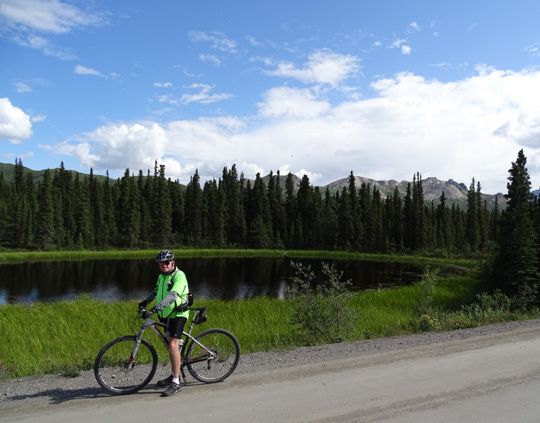 The bus passengers got a kick out of Sheryl's comment, too, and were duly impressed that Jim was riding the road on his bike. Not a lot of folks do that, although it's encouraged. 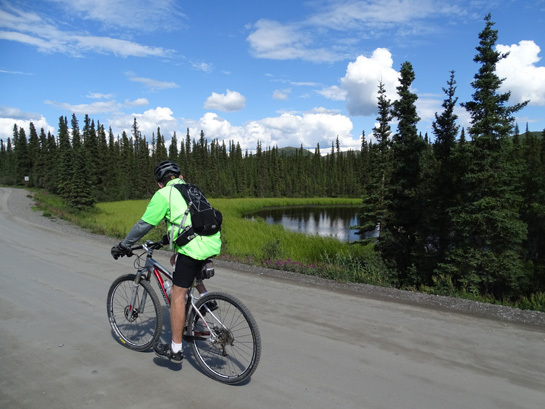 Cycling is a terrific way to see the park. 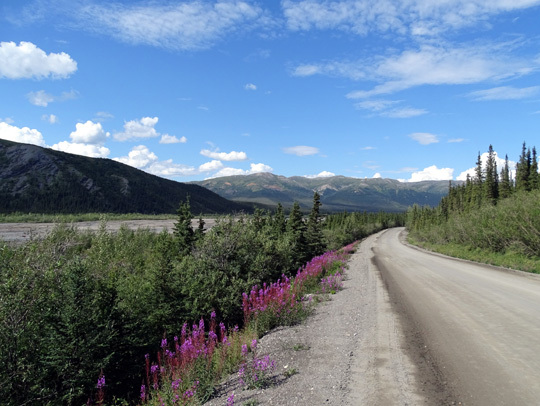 In our three trips to Denali so far, Jim's seen bears, moose, and caribou on or very close to the road during his bike rides and he's able to notice details you just can't see on the bus. Ditto for me on foot. 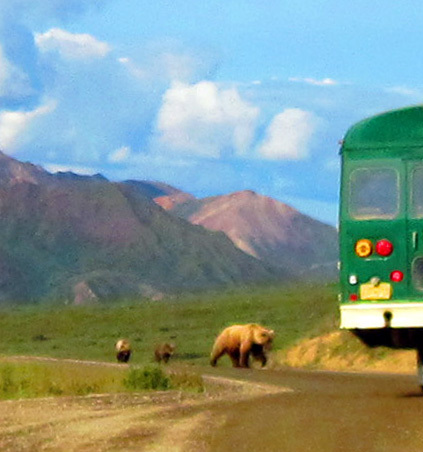 Cyclists can purchase tickets to ride camper buses out any distance in the park, where they can get off and ride in either direction on the road. They can catch another camper bus on the way back, if they want. Jim's not as fond of riding the shuttle buses as I am so he chose to just ride his bike from Tek and Riley Creek campgrounds while we were visiting the park this time. In at least seven bus rides out and back on the park road in 2012 and this summer, I've seen more people cycling on the park road than walking along it. 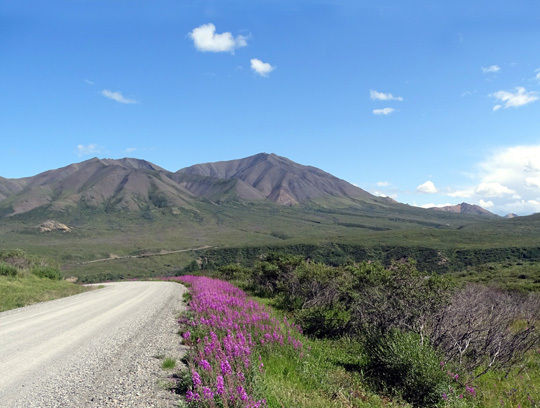 I've hiked the road near Tek but my two most memorable road walks were up and down the long hill past Savage River to access the trail up Mt. Margaret. 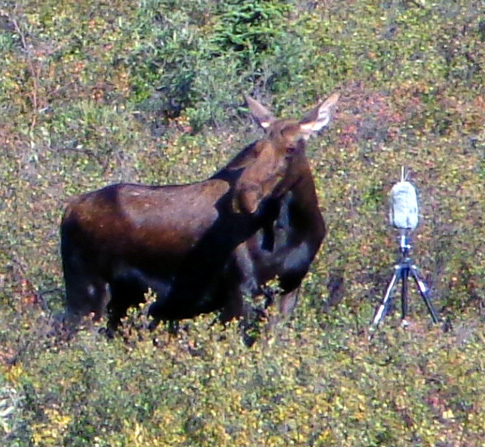 Both times three years ago I saw caribou and moose up close. Part of my goal today was to experience that thrill again. 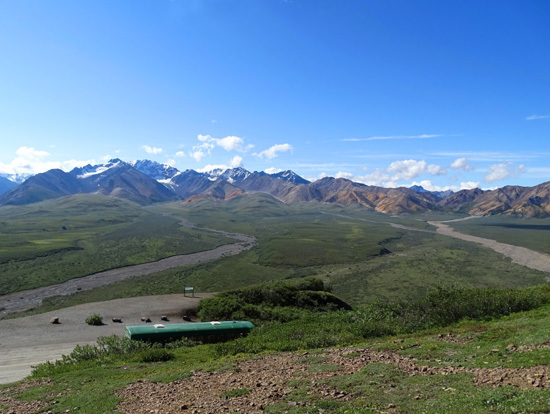 I got off at Polychrome Pass where the buses always stop for a few minutes outbound, and let Sheryl know I wouldn't be getting back on. 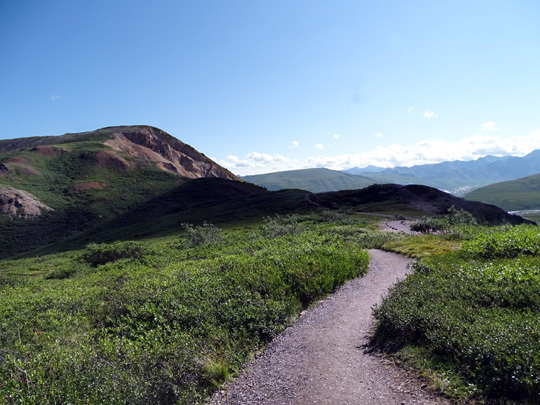 There's a loop trail above the overlook and you can also wander all over the hills up there. View south from the overlook; there goes my bus. I didn't see any of the falcons today but enjoyed the scenery. These rocks are also popular with Dahl sheep. I saw some there a couple times in 2012 but I haven't seen any of them in this location this summer. 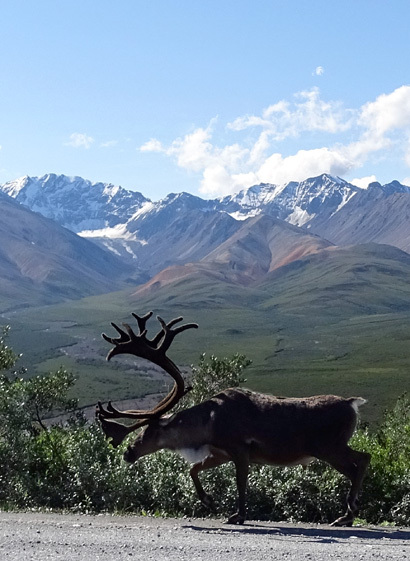 Although I didn't see any gyre falcons I did have a close encounter with a large bull caribou after I'd walked a little way down the road from the Polychrome overlook. See the tiny people at the overlook? I don't know if the people could see me or not. 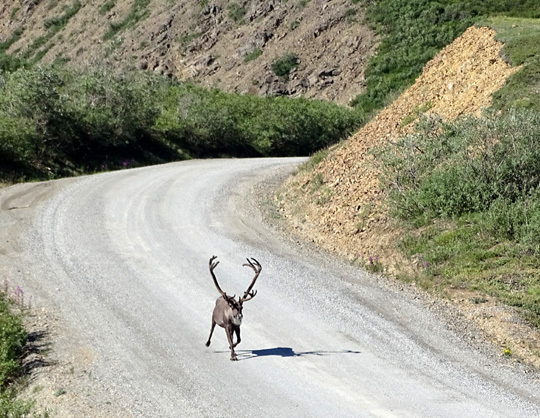 If they did, they probably thought I was nuts for 1) walking along the road and 2) being so close to a caribou with a serious rack. It's not like I followed him. 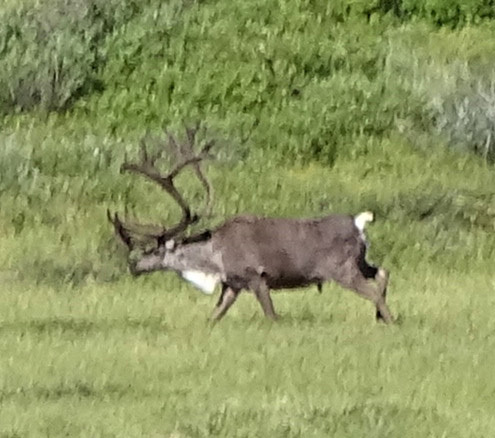 I know he's a wild animal but I've inadvertently been this close to caribou several times on the road so I wasn't fearful of him. 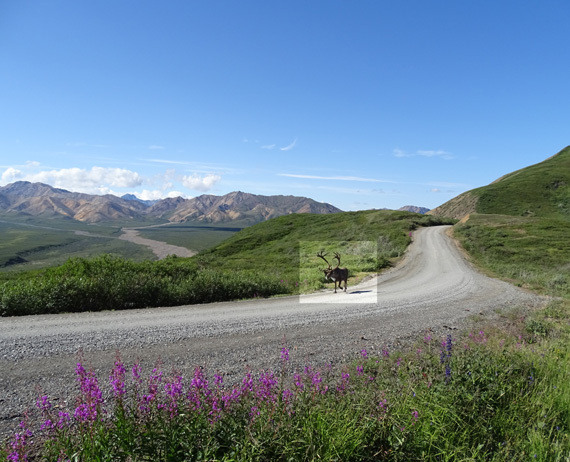 Moose tend to be more unpredictable this close than caribou are. 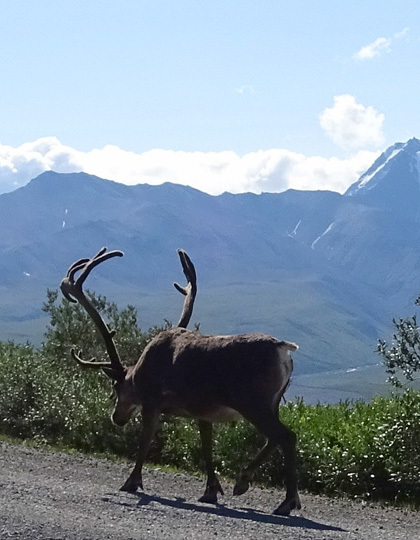 A couple buses stopped several minutes to watch the caribou as he walked up the road and into the brush. I couldn't see him when I got back to this point about 20 minutes later. I turned around after a mile and headed east. Before I got back to the overlook Jim came by on his bike. I was happy he got that far. 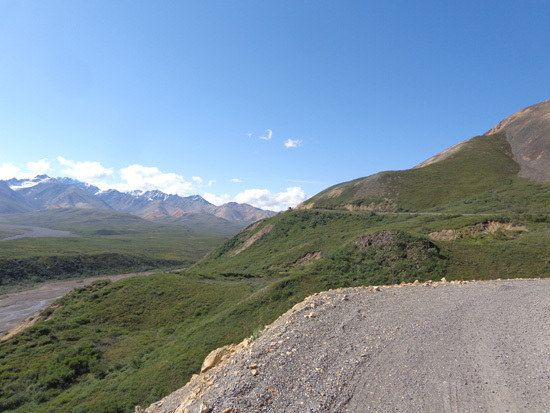 We talked a little bit, then he continued west for another couple miles till the road started down to the main Toklat River. 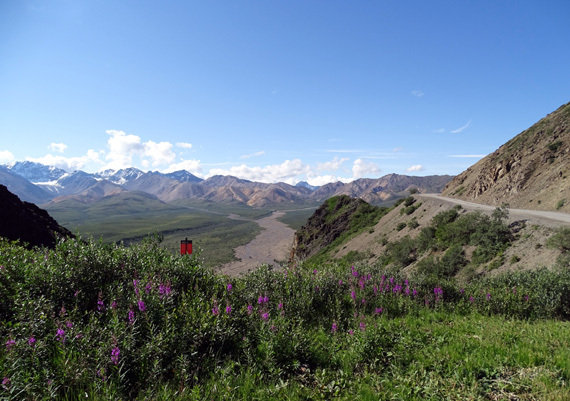 He knew he had two other long hills going back, including Sable Pass at 3900 feet, so he turned around before reaching the river. 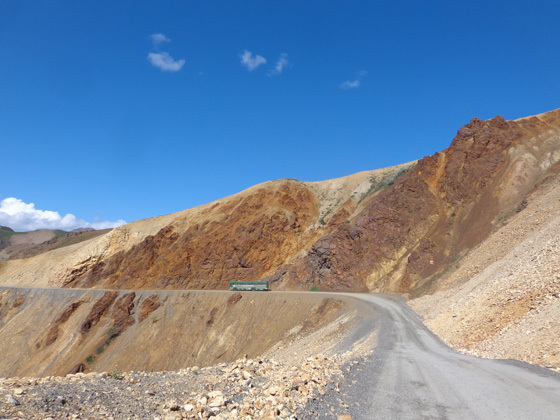 In some places the road is wide enough for vehicles to meet and pass each other. ahead and wait in a wider spot if they see someone coming. 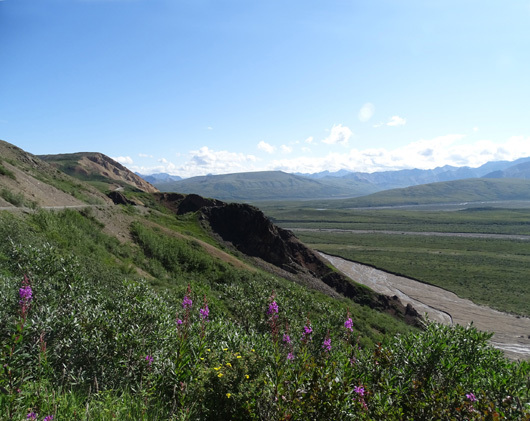 After I walked the two-mile out-and-back section from the Polychrome overlook I headed east along the road, high above the river bed. 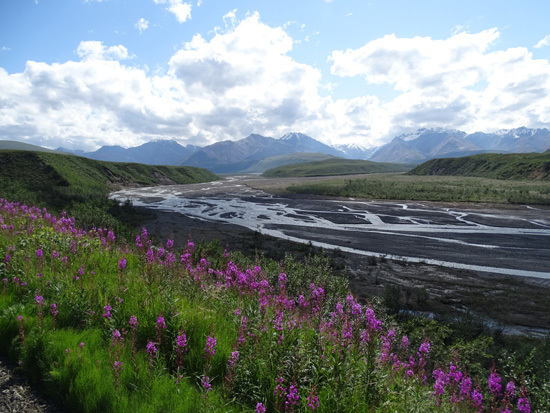 I continued to enjoy the magnificent views across the wide valley to the Polychrome glaciers and down to the meandering channels of water that funnel into the East Fork of the Toklat River. I wished I knew more about the colorful rocks close at hand. 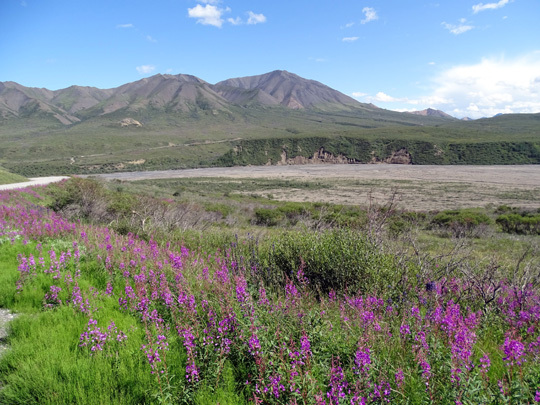 A geologist would go nuts around here with all the cool rocks and a botanist would love the pretty flowers. 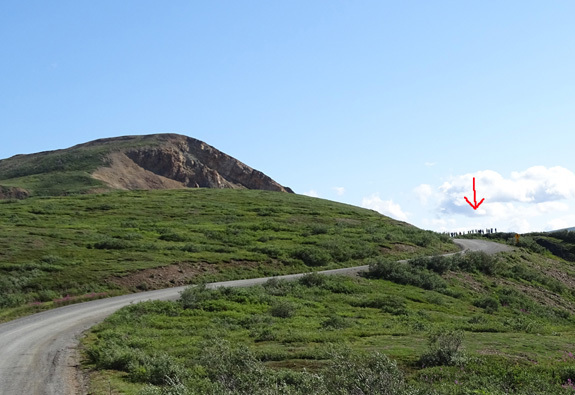 I noted the animal trail where the folks on my bus saw a coyote cross the road and climb the hill two days ago. 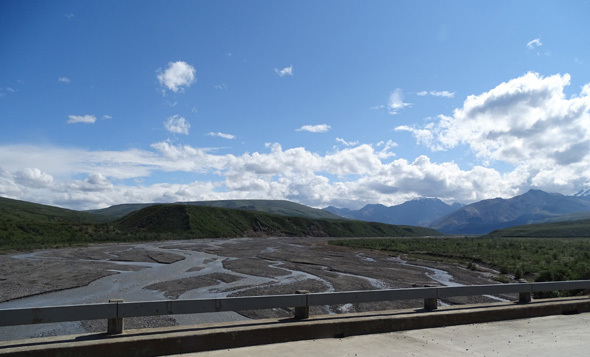 I scanned the riverbed for grizzlies but didn't see any. 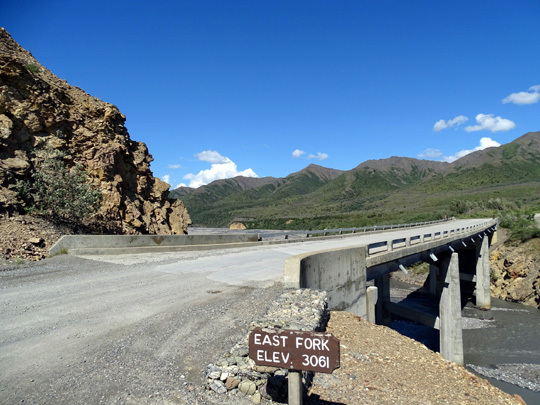 I did see one just past the East Fork on our way outbound this morning but the picture I took from the bus is fuzzy. It's amazing how much more you can see by walking, even better than cycling or running and certainly better than riding a bus or our own vehicle. 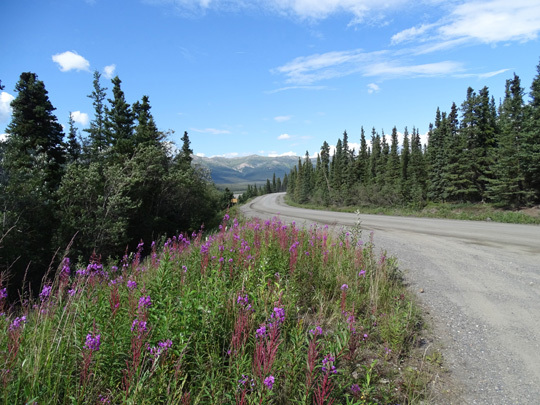 I enjoyed this road walk, but not as much as tundra hikes at higher elevations. We found a rock outcropping where we could eat our lunch. You should have seen the looks we got from bus passengers as they passed us! Some took pictures of us out their windows. In a few minutes we both took off, heading east. Shuttle buses, tour buses, and a few other vehicles came and went. I usually stayed to the outside, right above the huge drop, so they could better see me at the curves. Jim and I were together when two buses in one direction, and a bus and truck in the other direction, all converged where we were. 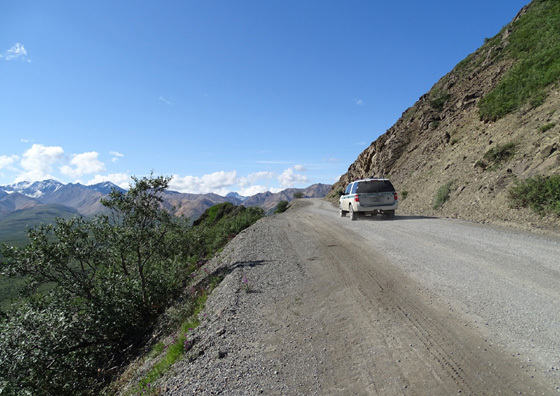 There was room for everyone to safely pass us and, fortunately, that was the only little bit nerve-wracking incident we had along the road. Buses and other vehicles were courteous and went very slowly by us. 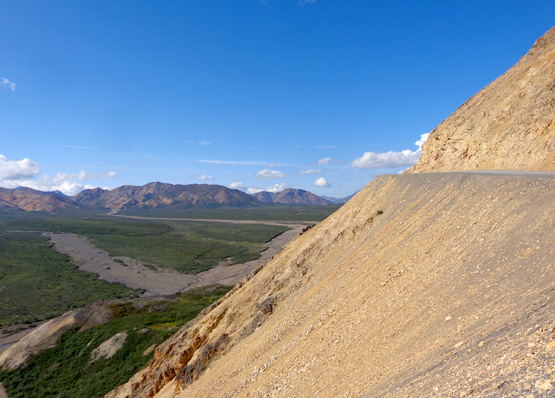 You can see how narrow the road is through the Polychrome Pass area; this is one of the wider spots! 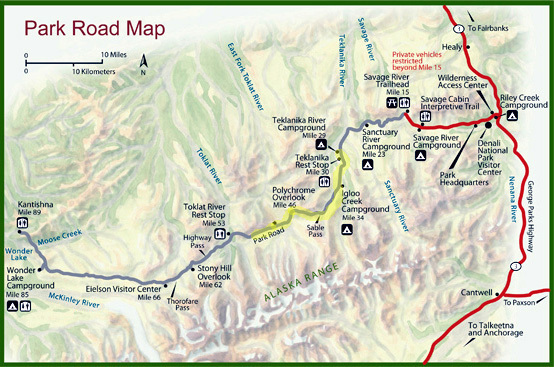 I stopped across the East Fork bridge to take off my two jackets, walked another quarter mile up the hill, then caught an inbound Eielson bus to the Teklanika rest stop. 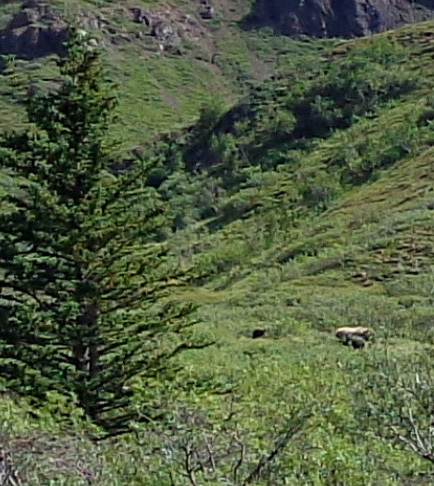 He also saw a bear at the bridge over the Tek river on his way outbound but wasn't able to get a picture of it. Before the buses began moving again I was able to talk to Jim out the window so he knew I was on a bus back to the campground. He'd already fed and walked the dogs briefly when I got back about 3 PM. I walked them each two more times at least a mile each, and also did about a mile solo along the river. 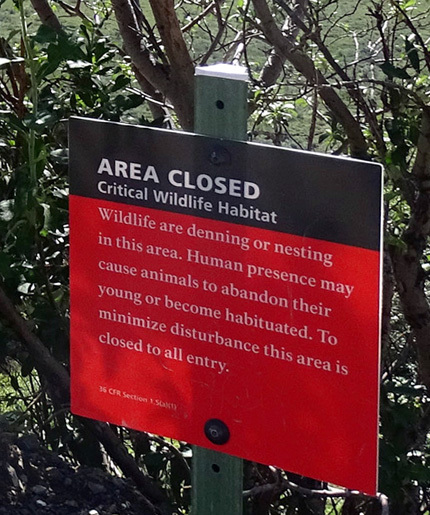 (Dogs aren't supposed to go out there because of the grizzlies). Jim rode Casey through the campground with the Walky Dog attachment on his bike before bedtime. I had a total of over 8 miles hiking today and Jim rode his bike about 36 miles. We both had fun and loved the nice weather. After supper Jim hooked the truck to the camper and we did some prep to leave Tek in the morning to return to the Riley Creek Campground closer to the park entrance. We also attended the ranger talk re: lynx, which I described in an earlier entry. Because of the wet, chilly weather and muddy road we weren't too happy when we got to Tek on Sunday. The rest of the time we've been here has been so nice that we're a little sad to leave. It'll be good to access the internet again at Riley Creek, though. 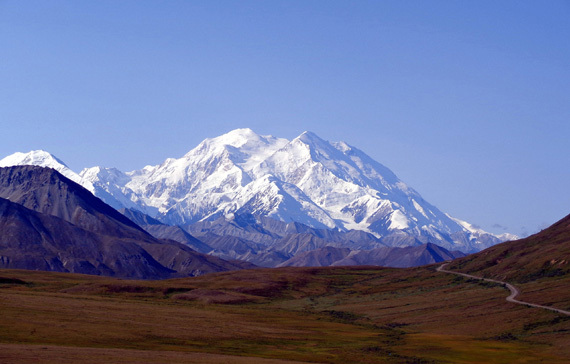 At least we aren't done with this trip to Denali. 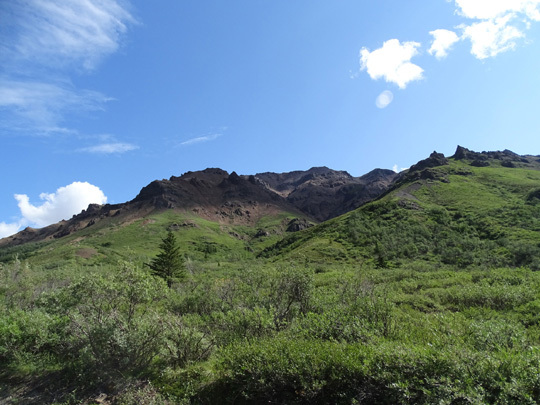 We'll be at Riley Creek CG again for five nights so we'll have time for more hikes and bike rides.